An engineering outline of the proposed wheelchair accessible fishing pier at Lakeview Park. Although cerebral palsy confines 18-year-old Chris Douglas of Waterloo to a wheelchair, it doesn’t stop him from enjoying one of his favorite activities. “He just loves to fish,” said his mother, Debbie Douglas. 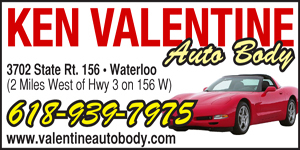 Chris and his mother visit Waterloo’s Lakeview Park at least a couple times each week. “He would sit out there all day (and fish) if we would let him,” Debbie said, adding her son can be more independent with fishing as opposed to other activities due to his condition. Unfortunately for the Waterloo High School senior-to-be, fishing access is difficult at Lakeview because Chris is unable to get too close to the water. But help may be on the way for Chris and all others who currently have a tougher time fishing at the park due to various disabilities. The Waterloo City Council on Monday night passed a resolution authorizing the application of an Illinois Open Space Land and Development grant to build a handicapped accessible fishing pier at the park. The idea for this fishing pier came from Waterloo Mayor Tom Smith and other city officials. If approved, the grant would pay for half of the roughly $80,000 project — more if community service organizations and area businesses are willing to donate labor or materials toward this effort. Project plans call for an Americans with Disabilities Act compliant floating fishing pier featuring a six-foot-by-30-foot ramp, 16-foot-by-24-foot platform, handrailing and two bench seats. A handicapped accessible parking area next to the new pier is also proposed. 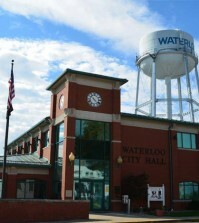 A public hearing took place prior to Monday’s regular council meeting, during which members of service organizations such as the Waterloo Lions Club, and officials from the Waterloo Park District and Monroe County Board, as well as local elder care facilities, expressed support for the project. “With support from the community, I think we have a good shot at getting this grant,” Smith said. Letters of support have also been submitted by State Representative Jerry Costello II and State Senator Dave Luechtefeld as part of the grant process, the mayor said. “I think this would really go over well in Waterloo,” Smith said. The city should know whether or not it will receive the grant sometime next spring. On Monday night, aldermen approved the reappointments of Susan Rosse, Judith Tomlinson and Andrew Wolkiewicz to the Waterloo Library Board. The council also approved a resolution establishing a prevailing wage rate for the city in compliance with the state’s Prevailing Wage Act.